Credit score matters everywhere – now even socially! Your credit score is important, we all know that! Â The time spent on social media can be carefully analyzed as well. Â As much time that is devoted to social media (Facebook, Twitter, Tumblr and WordPress to name a few). How can we possibly measure our social credit? Why with Klout of course. 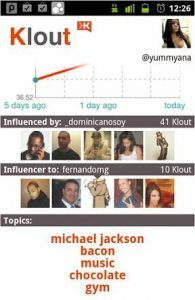 What is Klout? Â Klout tracks your credit score; your social media credit score.Â How much of an influence you are across social media. 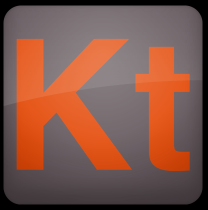 With the Klout for Android App you can easily keep track of your social credit score. Â The free app allows you to sign in with your twitter handle. The app is just one simple, informative screen. Â Once you’re signed in you see your Klout score in red-orange font. You also see the factors that make up your Klout score underneath in blue-green numbers. Your score analysis (your Klout score from 1-100) is based on your True Reach (The amount of people you influence in both your network and extended networks), Amplification (how much you influence people) and Network Impact (The influence of your network). Who Influences You.Â Who you influence and how you influence. Â This is done by analyzing the topics you cover. The â€œlikesâ€ and things that you â€œReTweetâ€. Â When you scroll down to the second half of the page you can see this information. Â It is underneath a line graph of your Klout score progress from 5 days ago to today. What is measured in your social credit score? Klout is still Beta.Â Not sure if itâ€™s going to pick up since there are still a couple of cons with the analyzed data.Â Mention a word in a tweet, such as the make of a car and it can be listed as one of your topics.Â You might not know anything about that car or cars in general, which can be quite misleading. Next articleGE DV1 Pocket Video Camera: Small and Cute, But Can It the Job? Analie is a Mobile Editor and Community Manager for G Style Magazine. A lover of all things technology, she uses gadgets for work and fun, but mostly fun. Your typical girly girl, one phone isn't enough. Currently using an iPhone 7 Plus and a Samsung Galaxy Note8, she doesn't have a preference when it comes to OS. When she's not connected to the world, you can find her playing with her beloved pets or enjoying the many sites New York City has to offer. Her latest quest? Finding all things chic and geek! Analie will soon be your fave Gadget Girl from NYC.